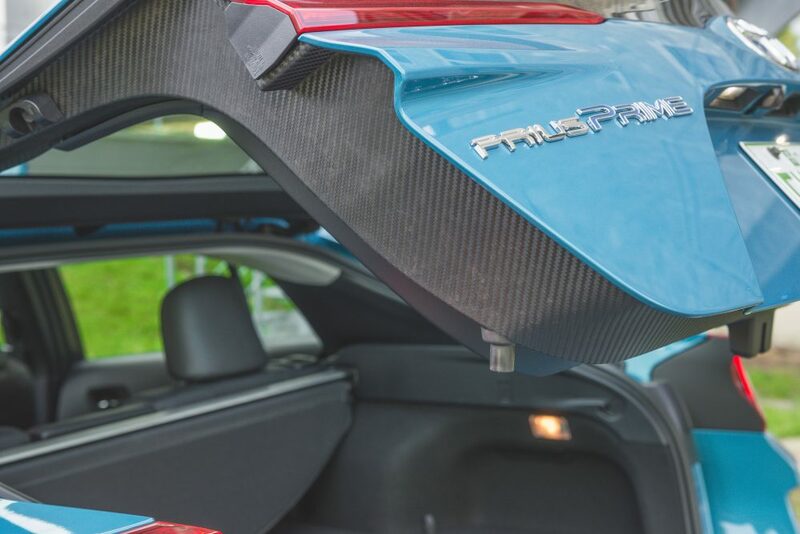 The 2017 Toyota Prius Prime Has A Carbon Fiber Trunk! No, really, it’s true. There’s carbon fiber in the trunk of the 2017 Toyota Prius Prime. Why should you care? Well, if the title of this post was “Toyota Prius Review”, would you have honestly clicked on it? I think not. I apologize for the click bait. 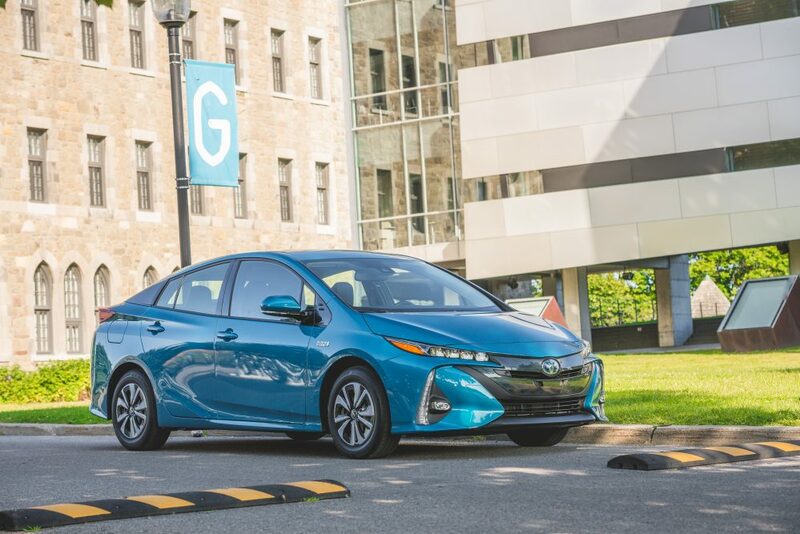 Carbon fiber is only one of the many engineering feats that constitute Toyota’s all new plug-in hybrid, the Prius Prime. From the outside, the car may seem relatively boring and not particularly exciting for us enthusiasts, but when looked at closely, more research and development was pumped into this thing than in some supercars. In fact, that carbon fiber comes from the same factory that built the Lexus LFA. The Prius Prime is a solid technological tour de force, and trust me, it’s a lot more exciting than you may think. 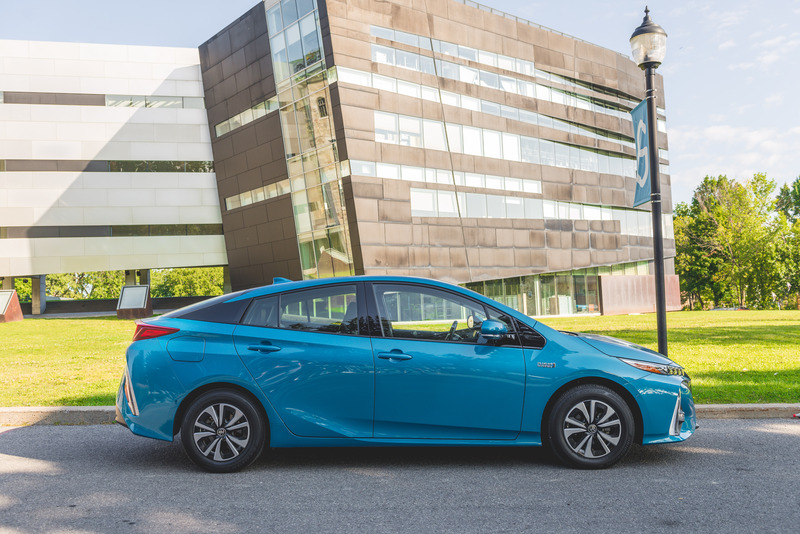 What makes this Prius different than the one Toyota launched just over a year ago? This one is the first ever mass production application (a short-lived small production existed in 2011) of a plug-in hybrid for the Prius nameplate. And no, it isn’t called the Prime because it’s an Autobot, although I wouldn’t be surprised if someone told me it was designed by one. This Prius is called the Prime because it represents, according to Toyota, the furthest a Prius has ever gone in terms of technology. The Prime is also stylishly independent than the standard Prius, which looks like it was designed by a three year-old. This one is equally wild, with intersecting lines and creases, but to be totally honest, as unusual as it may seem, I don’t find it ugly. Only the tiny little hubcaps give a somewhat dorky look, but they were actually put there for efficiency. I guess we could say the Prime’s overall design is a case of form follows function, kind of like a Mclaren P1 hypercar. Right. Overall though, this is still a well proportioned lift-back sedan that offers decent passenger space and abundant, but not extreme cargo space. 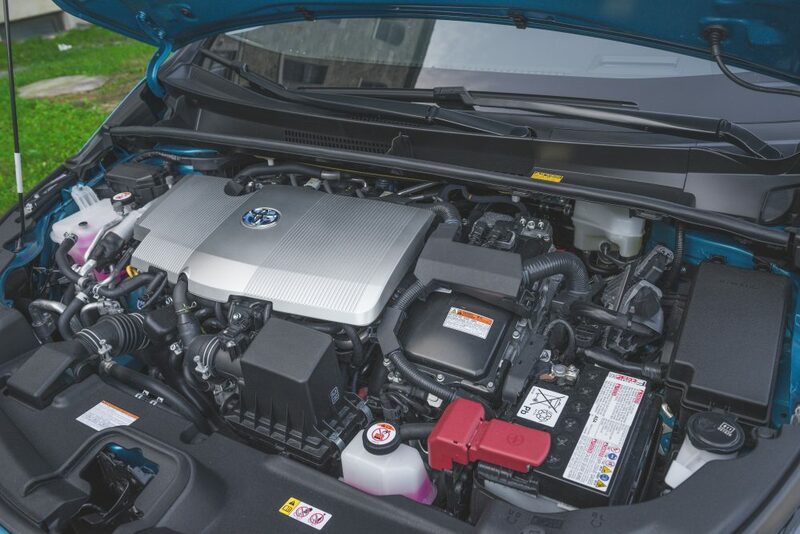 The basic Prius “daily-driver” virtues remain untouched. The biggest news for the Prime is of course its plug-in possibilities. 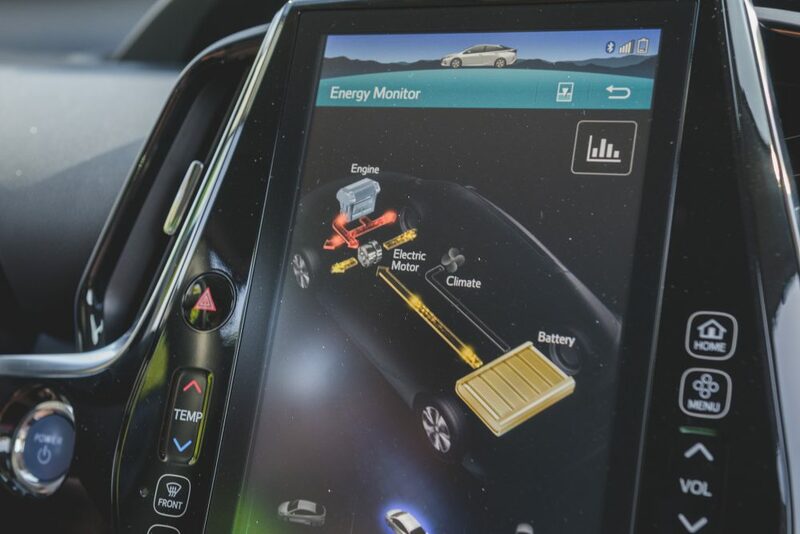 Connect it to a conventional home power outlet, and the car takes just six hours to fill up its batteries, much quicker than the Chevrolet Volt. Range, however, is considerably shorter than the Chevrolet at a total of about 42 km on full electric mode. But for urban commuters that spend most of the time driving their 15-20 km commute in traffic, the Prime offers more than ample go juice. And it won’t take an entire day to charge. Once the batteries are down, the Prime reverts back to being a normal hybrid, with a 1.8-liter four cylinder doing most of the work, coupled to another tiny little electric motor. Total power output in hybrid mode is an unexciting 121 horsepower. But don’t worry, like the standard Prius, nothing about the Prime will incite you to drive fast. This is one of the only cars I’ve driven that I didn’t mind being slow in. And yes, the Prime is slow. Even at full swing, this grasshopper green Prius will sprint to 100 km/h from a standstill in a “count it in your head” 11 seconds. 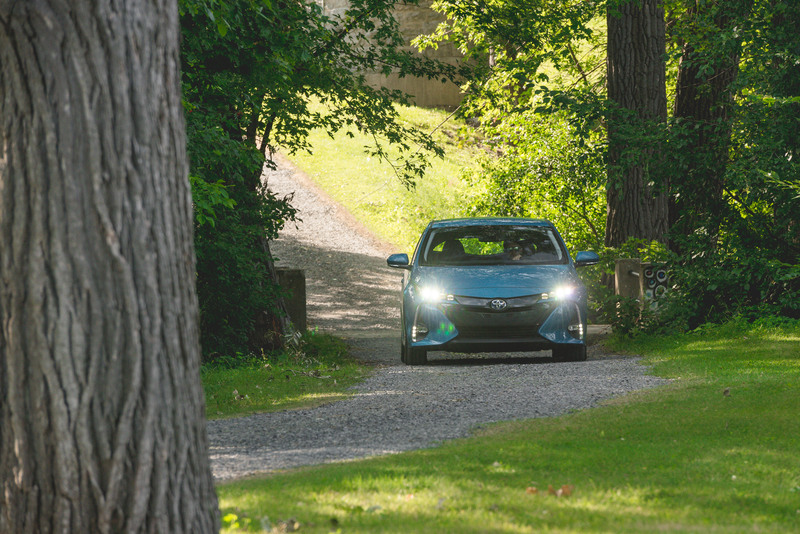 Accelerations are never spirited, instead, the car always glides smoothly to coast speed, stress-free, always reminding you that you’re driving a Prius, and that the trees must be saved . And they will, because even when driven in the most aggressive possible way, you’ll still hang around a 4.0L/100 km consumption average. On the road, the Prime is quiet, compliant, with a nimble chassis, solid poise and sufficient brakes. It’s also been fitted with what is arguably the best steering feel in this segment. I won’t go all the way as saying that the Prime is fun to drive, but it isn’t a penalty box, and it’s not afraid of hitting a corner fast. The entire experience feels as refined as a Lexus. Step inside the 2017 Prius Prime, and the funky, organic and futuristic design theme continues. 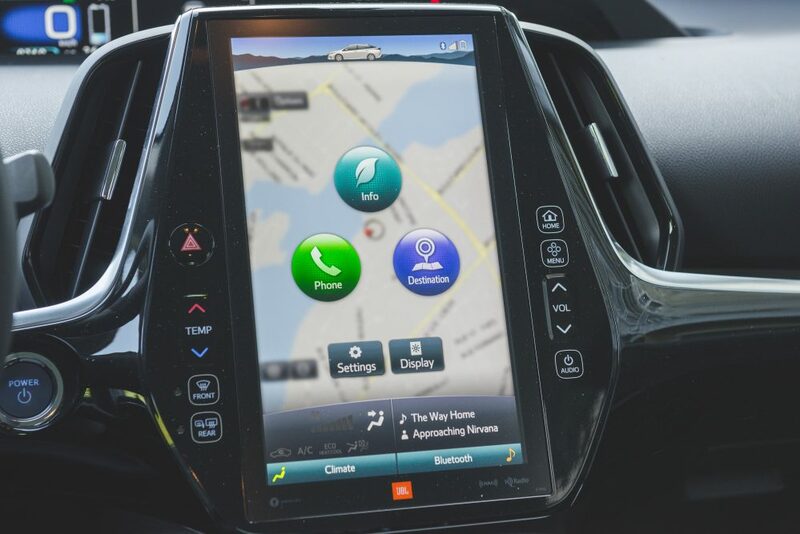 Like the standard Prius, the dashboard is central-mounted, where all occupants can see vital information such as speed, battery life, fuel consumption and even music stations. Down in the center stack lies an 11.6-inch touchscreen (7-inch on base models) which houses most of the car’s controls “à la Tesla”, and the only way tooperate the transmission is by way of a weird little knob of phallic resemblance. 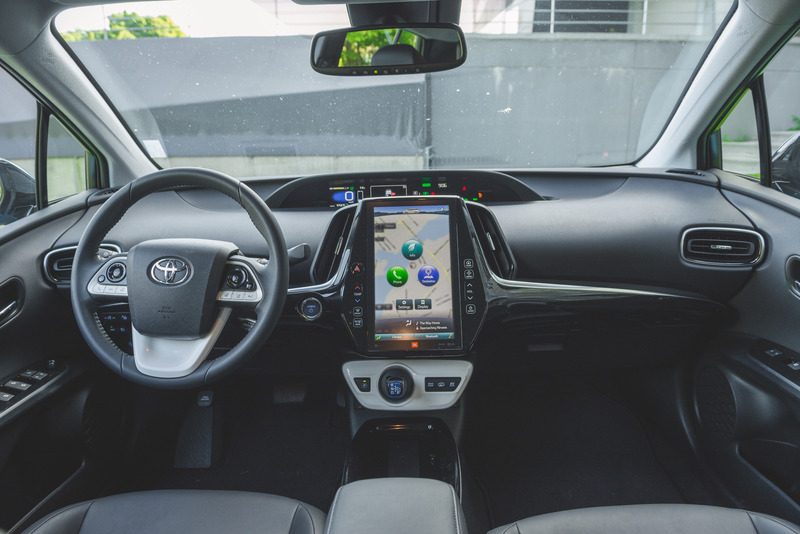 Luckily, the Prime’s infotainment system was developed in partnership with JBL, so menus, overal user interface and speed of operation are significantly improved over the standard Toyota setup. In the Prime, menus are stylish and information is easy to comprehend and find. This is one of the best infotainment systems I’ve sampled. For a Toyota, that’s a compliment. 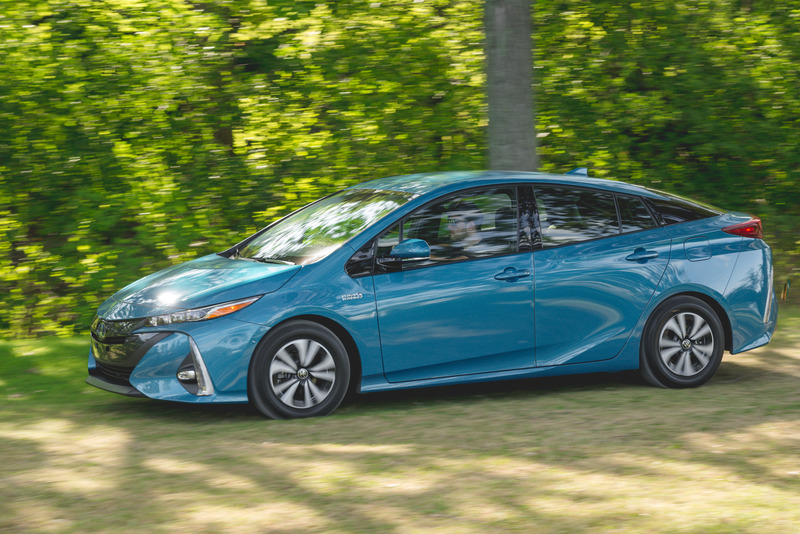 Pricing for a 2017 Toyota Prius Prime kicks off at $35,204. My tester was the only upgrade trim available, the Prius Prime Technology. It sells for $40,779, and comes with the fancy screen, QI wireless charging, the JBL 10-speaker sound system and parking assist. That’s not exactly what you would call cheap, but the Prime still sells for a few thousand dollars less than a similarly equipped Chevy Volt. It also beats the Volt’s L/100km-e rating at 1.7 versus 2.2. 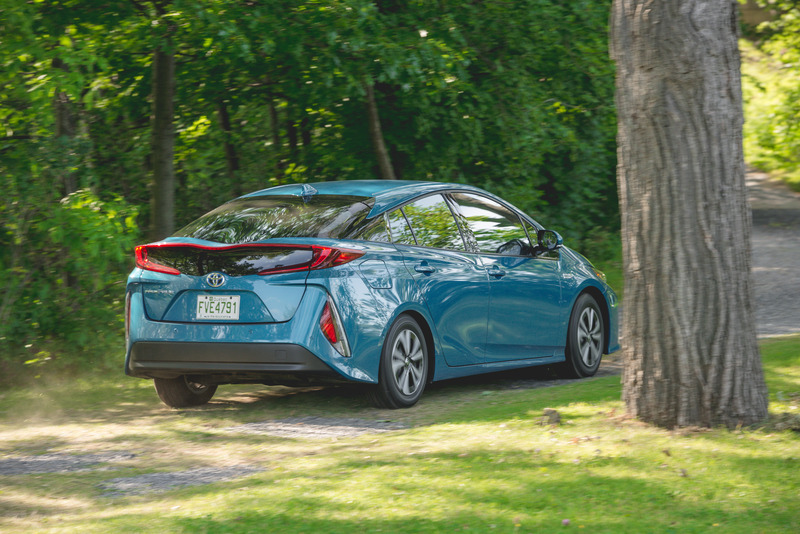 At the end of the day, the Toyota Prius Prime impresses by being a technologically packed machine that once more projects our mobility needs into the future without moving away from the traditional Toyota common sense we all know and love. 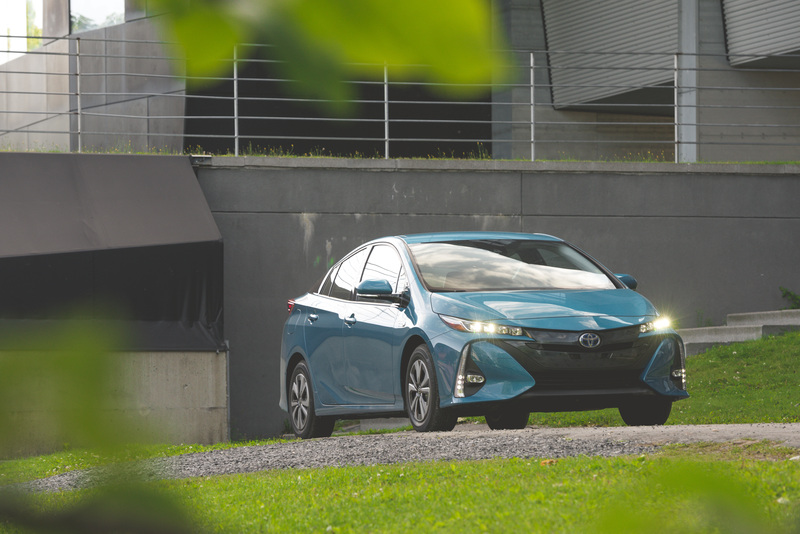 The 2017 Toyota Prius Prime isn’t exciting because it’s fast or particularly entertaining to drive. It’s exciting because it’s one of the rare plug-in hybrids out there that actually works with the realities of our daily lives. 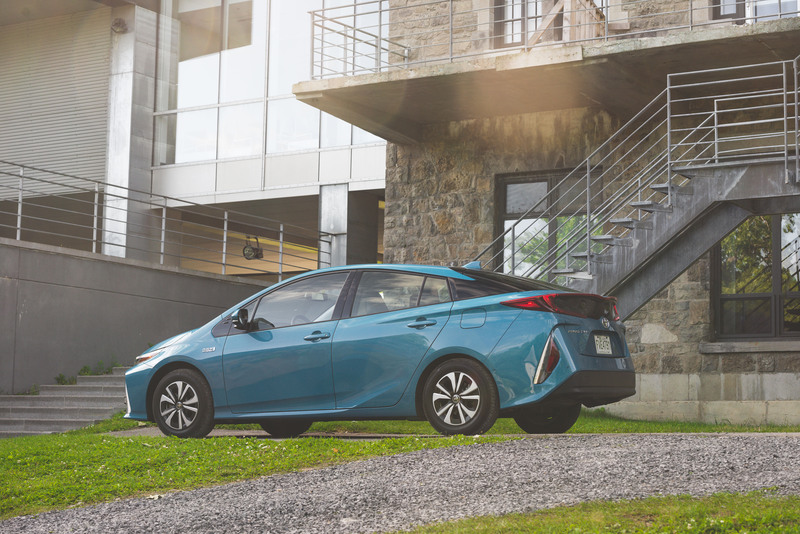 All the Prius we love with plug-in benefits. Intuitive and enjoyable to use infotainment system. Smooth and refined driving experience. EV range a little low.